I am looking forward to getting my mitts on Clotilde Dusoulier French Market Cookbook via the library, unless it is bestowed upon me as Birthday or Christmas gift. Anyway, I was happy to flick through her first cookbook Chocolate and Zucchini with renewed energy and decided to cook a recipe I've had bookmarked a long long while. I made her Cake Tomate, Pistache et Chorizo translated as Sun dried Tomato, Pistachio and Savoury Loaf a couple of weeks ago, if I am honest. I made it for D's lunch box, he had three times in one week. And I snacked on it, every time I went to the fridge. It made for easy eating. 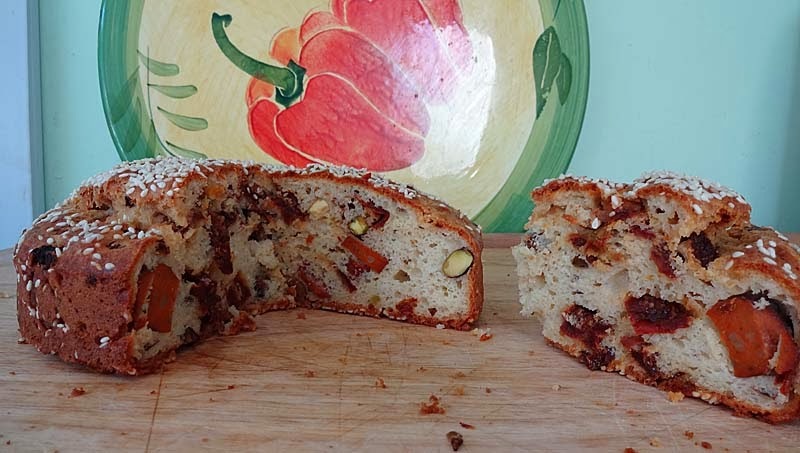 Savoury cake is certainly an acquired taste and one I have to say that I was acceptable to me. It has a twang from the yogurt and the sun-dried tomatoes, a little spicy kick from the chorizo and crunch from the pistachio nuts, that D loves. Preheat the oven to gas mark 4/180c. Butter a 8 inch round cake tin and sprinkle in 1 tablespoon of the sesame seeds and shake to make sure it coats the tin including the sides. In a medium bowl, mix together the eggs and yogurt. Sift the dry ingredients into the egg mixture, stirring until incorporated, be careful not to over mix. Gently stir in the chorizo, sundried tomatoes, pistachio and parsley. Then spoon the batter into the prepared cake tin, smooth the top, and sprinkle evenly with the remaining sesame seeds. what a great snack - I quite like using veg mock meats like this - did you need to use a bit more oil as veg versions usually have less oil? No I didn't at all. It worked well, in fact I've made another variation but will showcase that later on. I've not made tofu bacon as of yet, my husband really likes the one I make. I will have a go at some point with the tofu version. Thank you little vegan bear, just to point out this has eggs and yogurt. Pls let me know if and when you make the vegan version,i'd be curious to try it and who knows even replicate it. What a fascinating recipe. I'm not surprised that you bookmarked it. 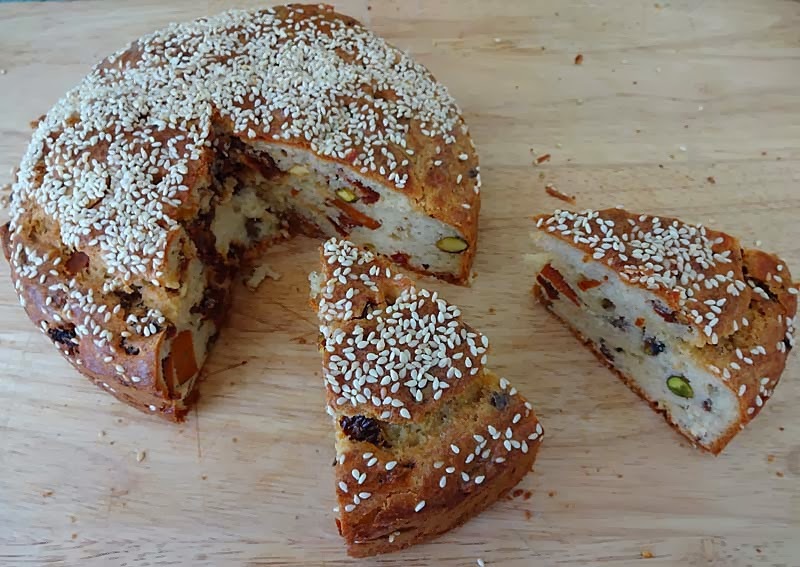 I've not tried many savoury cakes before and I have to say that this sounds really tasty. I am also impressed that you made your own vegan chorizo! 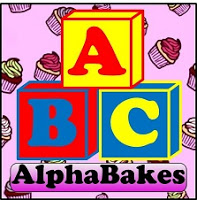 Thanks for entering AlphaBakes. Thank you Baking Addict. I was a bit nervous that you may not accept it in the challenge, thank you for doing so. I've never seem anything quite like this Shaheen. It is such a beautiful bake. Bet it was good! Thanks for entering it. Thank you Jac. Yeah, I really enjoyed it with the veggie chorizo, which reminds me I will have to make some more this week.